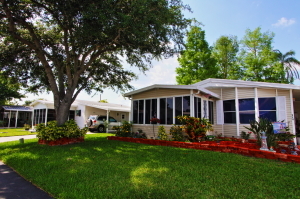 The manufactured homes that are for sale at Hyde Park – a 55+ community in Central FL – make it possible to lead a peaceful and affordable lifestyle. Inside of our community, you will find a wide selection of affordably priced homes in various sizes along with a variety of resort-style amenities for our residents’ use and enjoyment. More than just a community of manufactured homes, Hyde Park is a professionally managed age-restricted retirement development for adults 55 and over who desire affordable, low-maintenance housing, lots of amenities, and the ability to participate in an assortment of structured activities. In fact, Hyde Park isn’t just a place to live … it’s a lifestyle. Affordably priced manufactured homes, combined with great amenities and professional onsite management, make it possible for our residents to stretch their retirement nest eggs to the fullest. Please contact us today if you would like to learn more about what makes Hyde Park such a great community for active adults 55 and older. If you plan on being in Central FL, we will be happy to schedule a time for you to take a tour of our community and see our selection of manufactured homes for sale in person.